Other than Weight Loss and Healthy skin, there are many more benefits of Avocados. Numerous studies have found that a predominantly plant-based diet that includes foods such as avocados can help to decrease the risk of obesity, diabetes, heart disease and overall mortality while promoting a healthy complexion and hair, increased energy and overall lower weight. To make sure Avocado is ripen, Select darker colored (almost Black) Avocado. Hold it in one hand and Slice slowly down the center lengthwise around the seed, starting at the narrower end. Slice the avocado in half or cut into wedges. Then pull outer dark layer or skin away from the inner green flesh of the fruit. Now cut avocado into small pieces. Throw away skin and seed. Now take 1 cup milk and 2 teaspoons sugar to make avocado smoothie. Put avocado, milk and sugar in the jar and grind it just for few secs. 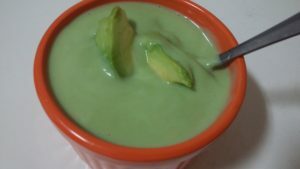 Avocado smoothie is ready. Serve it in a cup or bowl. You can add more milk or ice to make it dilute.